1. I love your music, and we’ll get to discussing that soon, but first, as a woman, seeing a woman who looks as drop dead gorgeous as yourself, I have to ask, what is your secret to staying in such great shape? And if you tell me soda and French fries we’re ending this interview at question one! In a nutshell? What works for me personally? I hike in an old growth forest with my dogs a few times a week, get a great kitty cat stretch with yoga poses every day and practice aikido. I also dance without inhibition and play instruments regularly. I eat only organically, about half of which are raw fruits. I eat organic vegetables and meats almost exclusively produced locally. I eat no corn in any form, including high fructose corn syrup and dextrose, no wheat in any form including bread, pasta, baked goods, sauces or breading, and no other gluten-containing grains. I use food as medicine. It’s interesting that you ask, as I am writing a book about Faerie Magic, and it touches on this subject a few times. Obviously, glamour is one of the most well-known types of faerie magic! We have appropriated the word in modern times to refer to high fashion, movie stars and “an air of compelling charm, romance, and excitement, especially when delusively alluring.” The glamorous beauties of the fashion and entertainment world are now uplifted and perfected with the art of modern technology! The magic of Photoshop creates a beautiful illusion which, for better or worse, has seduced the world. So first let me acknowledge that magic in my public persona. However, it goes deeper. My beauty reflects my magic, because I have cultivated my beauty magically for a number of years. The idea of visualization is becoming quite popular now, but as a child I knew it innately, and formed in my mind again and again the shape I desired for myself. The other aspect of beauty that I think is really important is self-care. If we tend to our bodies as we would lovingly care for a child, an elder, or even the Goddess Herself, we will reap the benefits exponentially as we age. By tuning into the body’s deeper nutritional needs, and to our spirit’s playtime/physical exercise needs, we can bring our bodies back into natural balance. I have found that people who carry the faerie energy may often be thin, yet are sometimes still fairly out of healthy balance with their natural cycles. It’s more important to play than to work out. Bring the element of play in, and choose a way to get some physical exercise that is so delightful that you will happily put off work for it! The same principles apply to the dreaded dietary changes required by “health.” Instead of trying to make some dramatic and inevitably ill-fated change, simply start by dropping major sources of bad food in your life 6 days per week. Give yourself a day off per week from any diet you are doing (unless it’s a food allergy). Start by swearing off fast food and coffee, soda or other sweetened drinks. Once you have done this your taste buds will start to readjust to natural food after the ultra-enhanced flavors of pre-made food are done away with. Then it’s time to get creative exploring the exotic world of fruits and vegetables! This should be what you eat most of the time. The choice to eat meat is very personal. It is an ethical decision which has, at times, pained me greatly. My physiology runs at optimum with meat in my diet, but I am scrupulous about only consuming meat which is given a good life, with natural feed, sunshine and grass to roam in. I don’t support any genetically modified feeds, or weird hormones or drugs given to the animals. Insisting on organic will mostly guarantee these standards, but you must trust your instincts and assess each company on its own. We live in such a culture of too-many-good-things! A bit of chocolate or a cookie isn’t going to kill any diet… In fact, soul food is very real and famously healing on all levels. When your heart needs it, indulge intelligently in something organic. 2. Your first album, “Sellisternia”, has a very electronic/techno sound to it. You followed that with “OakSong” which is more Celtic rock in its sound. What inspired the change? Sellisternia, meaning a “feast in honor of the Goddess,” was a priestess alone in her studio learning the art of expression via technology. I had never really played music with other people. My studies were in classical piano and composition… both of which can be fairly solitary. I was dizzied with possibilities as a producer called Mother shepherded me through my first recording sessions with concert harp, flute, trombone and my own vocals. This process was going on in 2000-2002. I had no concept of what he was doing as he used EQ and effects on the tracks. By the time I did OakSong I had been playing with this awesome band, Advanced Bliss, for 2 years. I had taken my education to the next level at USC, and gotten much deeper into technology, arranging and orchestration. I wanted to take those songs that we had been so successful with playing out, and capture them in a studio setting. Here I turned to the magic-man Christian Wood for my engineering and mixing. It was a completely different process… Still some songs were developed with the band, and others came as mystical revelations. The album itself is both dreamy and provocative, much like Radiohead. 3. You’re also an extremely talented harpist. Any chance there will be a solo harp album someday? Thank you so much! You know how to make a girl feel comfortable! I actually think I might have recently granted your wish! Faerie Archives volume 1 is our latest release—it’s brand spankin’ new, in fact! It features predominantly harp, but it is steeped in worlds of lush high fidelity nature sounds, delicate vocal harmonies, and exotic ancient instrument such as the medieval Viola de Gamba and Sitar. We invoked the faerie realm, created a magnificent faerie altar, left offerings and made invocations (some of which are audible on the CD). 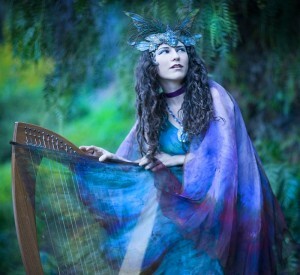 We invited the faeries in, and we recorded the music that came to us. The music was so very unique that we were inspired to start the “Society for the Preservation of Faerie Arts.” Learn more at www.faeriearchives.com. Samples of the newest release can be heard on my MySpace page and the best way to purchase the album is via CDBaby.com. Enjoy! 4. On your My Space page there is your version of the Blondie song “Rapture,” including a music video for it. I love the original and your cover; what made you decide to cover that song? I love the original! Blondie is such an inspiration. I worked on that piece with producer Nick Launay (Yeah Yeah Yeahs, upcoming Cribs featuring Johnny Marr, Arcade Fire) and he thought I would really shine with the range of that piece. We wanted to give Retro-Gothy-New-Wave some “new school” claws. I think it worked. 5. Can you tell us a little bit about some of the folks that travel and perform with you? I have just posted a video blog of our latest tour on Youtube! You can go to http://www.youtube.com/user/thehighpriestess22 to see the goings-on! My dearest companion is my husband, Alexander Polinsky. He is my best friend and collaborator. It was his amazing faerie altars which opened the portal to the other realm. He has quite a lot of notoriety on his own, actually. He was a child actor on the series Charles in Charge, and has gone on to a successful career in voice acting. He is heard all the time on shows like Transformers, Batman, Legion of Superheroes and Starship Troopers. He is also an amazing singer, and fronts our band Flow Temple. He works one on one with performers, healing blocks and facilitating authentic singing and voice acting. I couldn’t do it without him. I also have a very dear butler named James. He and I have been friends for about 13 years now! He actually played piano at my 19th birthday party. We have lived together, and played music together for the last 5 years, and he also is an important person in the tribe. He is a student of astrology, and always advises us on possible arising situations. James plays the vibraphone, which is sort of like a xylophone but dreamy. He comes from a family of musical geniuses, and his brother actually plays guitar with the Eagles. 6. What is the House of Bliss? The House of Bliss is an outpost of love and authenticity amidst this modern Babylon! It originally started as my place of healing… and by the grace of all the amazing creatures who have passed through the doors, it has become an interdimensional portal, a food garden, a healing oasis and a very effective place for making beauty in a myriad of forms. In short, it is where we live. 7. For you, what is bliss? Mmm! So many things! For now I’ll say only a few things. A purring cat, the morning sun, the rain at any time, delicious food, chocolate, playful dogs, an unexpected dance, musical or visual inspiration, a well-sung tune, playing my harp, hearing the wind play my harp, long kisses, happy people working together, voices in harmony, union with the Goddess, true awareness of the moment and the open road. 8. Are you familiar with Paul Avgerinos? He’s the only other musician we’ve featured here so far at The Magical Buffet. Anyway, I think a collaboration between you two would be brilliant and inspired. If you two ever do an album together, will you dedicate it to me? Absolutely! And I’d be thrilled to do an album swap if he’s game! 9. What is one of your favorite albums that would most surprise our readers? One of the most sublime albums of all time is Beethoven’s 3rd and 4th piano concertos. This is my painting music. Stuff that is fried, preferably with cheese.